The Duna Express has arrived at the planet Duna. 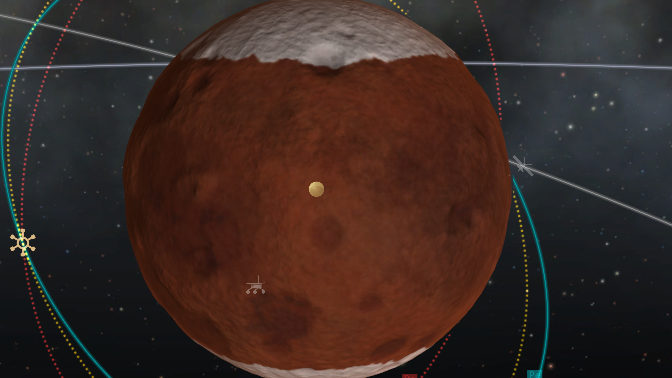 This multi-craft mission will survey the Duna planetary system for Kethane and locations for possible future terrestrial bases on the planet Duna and its moon, Ike, which some scientists believe to be a proto-planet that was captured by Duna’s gravity during the formation of the Kerbol system. Duna Explorer 1 probe makes an orbit correction burn. The Duna Explorer mission consists of three spacecraft. Duna Explorer 1 is a probe that has the primary mission of mapping out Kethane deposits within the planet Duna. Ike Explorer 1 is a probe of very similar design to Duna Explorer 1 that will primarily map out Kethane deposits within Ike. Duna Rover 1 is a rover that will land on Duna and perform a variety of surface experiments that will aid future exploration to Duna. Kethane is the primary driver of this mission. Scientists have discovered that it is easily refined into usable spacecraft fuels and missions such as Duna Express continue to expand the realm of where kethane is known to be found. Earlier last year, the Explorer series of probes found large deposits of kethane on Kerbin, Mun and Minmus. Hopes are high that this valuable natural resource is available throughout the Kerbol system which would aid greatly in future deep space and long duration missions into and within the cosmos. Refining kethane into a usable fuel is easy and has already been done on the surface of Kerbin, however scientists and RUD engineers are still designing space craft that will be able to refine the commodity in space. Many spacecraft designs and concepts are being analyzed and we are likely to see the first launch prototypes later this year. Duna Explorer 1 is a medium-sized space probe fitted with a KE-S210 Compact Survey Unit that uses an advanced type of radar that can detect subterranean kethane deposits from orbit and semi-accurately determine the density of the deposits. The probe is fitted with an ion drive for long term maneuvering and course corrections. To power the ion drive, Duna Explorer 1 is fitted with a large array of solar panels that also recharges a massive battery array. It is also fitted with medium gain omnidirectional antenna and a high-gain antenna for communication with Kerbin-based stations. The craft was built for longevity and will continue to act as a critical communication backbone for future missions to the Duna system long after the completion of the primary kethane survey mission. Duna Explorer 1 has an indefinite mission length. Ike Explorer 1 is a craft of almost the same design as Duna Explorer 1. It will survey Ike for kethane deposits and act as a communication relay link for the Duna system. Ike Explorer 1 also has an indefinite mission length. Duna Rover 1 is set to touch down on a large field where a kethane deposit was detected during initial surveys by Duna Explorer 1 as it entered the Duna system. The deposit is near the equator of Duna and the terrain is mostly rolling hills. 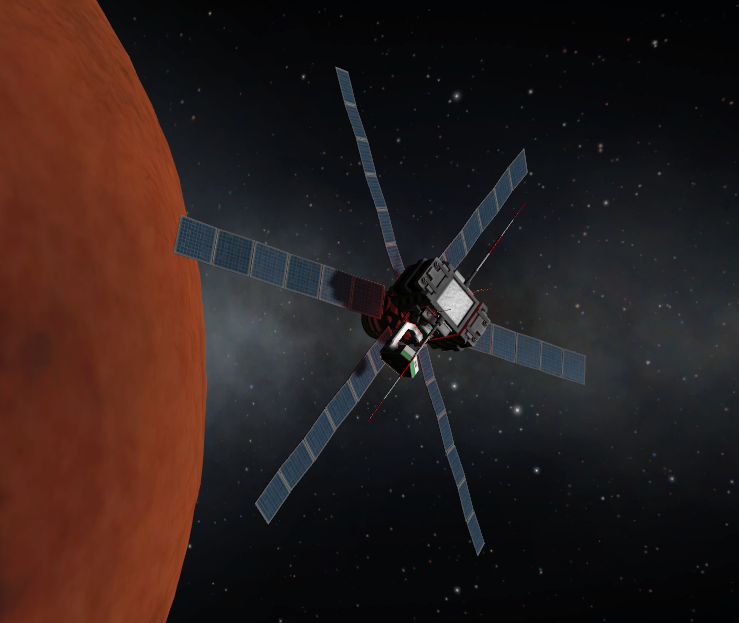 Duna Rover 1 will use the Duna Express bus stage to deorbit and eventually land on Duna. The Duna Express bus stage is an atomic-powered rocket motor that was used to carry the Duna Express mission package from high Kerbin orbit across interplanetary space to Duna. Duna Rover 1 is fitted with a variety of instruments to include a radar system that will test the density and composition of the ground from the surface to the kethane deposit below which will provide data to scientists that will determine the feasibility of drilling for kethane on Duna. Ike Explorer 1 has already been jettisoned from the Duna Express bus and is on its way to Ike to begin its mission. Once within Ike’s gravitational capture, Ike Explorer 1 will stabilize and circularize its orbit for maximum efficiency of both time and fuel when surveying Duna’s only moon. Duna Explorer 1 and Duna Rover 1 are still attached and considered a single spacecraft. Sitting atop the Duna Express bus, they will remain as one until it is time for Duna Rover 1 to begin steps to land it safely on Duna. Photo of the Duna Express mission payload stack on top of the Duna Express interplanetary bus taken the day before launch. The entire launch vehicle weighs 156.6 tons. Once separated, the Duna Express bus will fire its engines and burn retrograde and make necessary course corrections that will guide the rover to set down atop the kethane deposit that RUD scientists hope to analyze. Once the spacecraft is on course to the landing location, Duna Rover 1 will jettison Duna Express, which will impact with the Duna surface at a high velocity. This is to prevent space junk from building up. Duna Rover 1 will open its parachutes once it has braved the high temperature of atmospheric drag and deceleration. Because the atmosphere of Duna is 20% as dense as the atmosphere on Kerbin, more parachutes are required to slow the craft down than would be needed on Kerbin. Parachutes will open at an altitude of 7.8 kilometers to slow the craft down for landing from 1500 meters per second to 10 meters per second. Once the landing radar onboard Duna Rover 1 detect that the rover is less than 10 meters from the surface below, it will jettison the parachute structure that is attached on top of the rover. The rover suspension system will absorb the impact. Once landed, the rover will undergo a full Duna day of testing of onboard systems starting with computer and communications systems. It will then perform a variety of experiments that do not require it to move such as atmospheric and temperature testing. Once the batteries are topped off after a full day basking in the light of Kerbol, mission control will give a green light for the mobile mission where the rover will survey several locations to determine feasibility of drilling for kethane. Download Craft File for Duna Express – Requires Mechjeb 2.0.9 and Kethane 0.7.5.